Use the hipchat action to send messages to HipChat rooms or users. To send HipChat messages, you must configure at least one HipChat account in elasticsearch.yml. You configure HipChat actions in a actions array. Action-specific attributes are specified using the hipchat keyword. You must specify the message attribute for all hipchat actions. If you omit the account attribute, the message is sent using the default HipChat account configured in elasticsearch.yml. The name of a HipChat account configured in elasticsearch.yml. The message you want to send to HipChat. The HipChat account to use to send the message. The message content. Can contain up to 1000 characters. The format of the message: text or html. The background color of the notification in the room: gray, green, purple, red, yellow. The name that appears as the notification sender. Only valid for accounts that use the v1 profile. The rooms that the notification should go to. Accepts a string value or an array of string values. Must be specified when using the v1 profile. At least one room or user must be specified when using the user profile. Not valid for the integration profile. The users that the notification should go to. Accepts a string value or an array of string values. At least one room or user must be specified when using the user profile. Not valid for the integration or v1 profiles. You configure the accounts Watcher can use to communicate with HipChat in the xpack.notification.hipchat namespace in elasticsearch.yml. Both v1 and v2 HipChat APIs are supported. 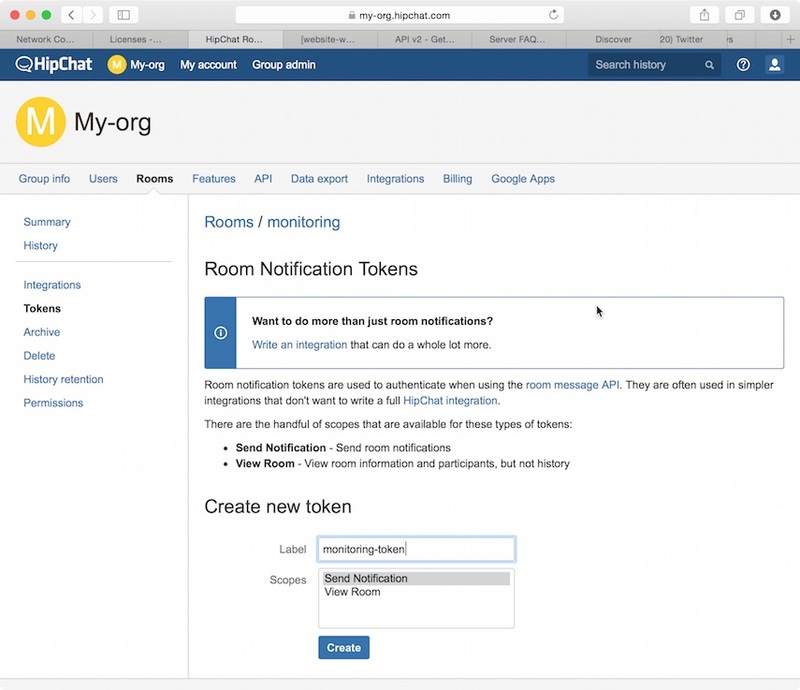 Sends messages to a specific room using HipChat’s v2 API Send room notification. Sends messages as a particular user through the HipChat v2 API. Enables you to send messages to arbitrary rooms or users. Sends messages to rooms using HipChat’s v1 API rooms/message. The v1 profile is provided because it is simple to set up and this API is familiar to many users. That said, HipChat has deprecated the v1 API and is encouraging users to migrate to v2. Both the integration and user profiles are based on the HipChat v2 API. If you configure multiple HipChat accounts, you either need to set a default HipChat account or specify which account the notification should be sent with in the hipchat action. You can use the integration profile to send messages to specific rooms. When you set an account’s profile to integration, the messages are sent through HipChat’s v2 Send room notification API. 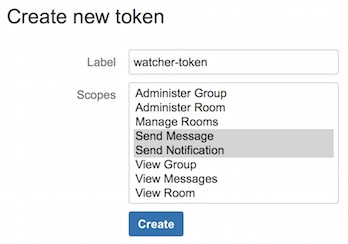 When you use the integration profile, you need to configure a separate HipChat account for each room you want to send messages—the account configuration contains a room-specific authentication token. Alternatively, you can use the user or v1 profile to send messages to multiple rooms. The integration profile only supports sending messages to rooms, it does not support sending private messages. Use the user profile to notify a particular HipChat user. Log in to hipchat.com or your HipChat server as a group administrator. Go to Group admin > Rooms. Click the name of the room you want to send messages to. Enter a name for the token in the Label field. Select the Send Notification scope. Copy the generated token so you can paste it into your HipChat account configuration in elasticsearch.yml. Set the type to integration. Set room to the name of the room you want to send messages to. Set auth_token to the room-specific authentication token. You can use the user profile to send messages to rooms as well as individual HipChat users. When you set an account’s profile to user, Watcher sends messages as a particular user through the HipChat v2 API. Add a HipChat user for Watcher. When setting the user name, keep in mind that the messages are sent on behalf of this user. Log in to HipChat as the Watcher user. Go to https://<hipchat-server>/account/api. For example, https://www.hipchat.com/account/api. Select the Send Notification and Send Message scopes. Set the type to user. Set user to the email address associated with the Watcher user. Set auth_token to the Watcher user’s authentication token. You can use the v1 profile to send messages to particular rooms. When you set an account’s profile to v1, messages are sent through HipChat’s v1 rooms/message API. The v1 profile uses a deprecated API that is expected to be removed by HipChat in the future. The v1 profile only supports sending messages to rooms, it does not support sending private messages. Use the user profile to send private messages to HipChat users. Log in to your HipChat server as a group admin. Go to https://<hipchat-server>/admin/api. For example, https://hipchat.com/admin/api. Set the type to v1. Set auth_token to the v1 authentication token you generated. You can also specify defaults for the message attributes.